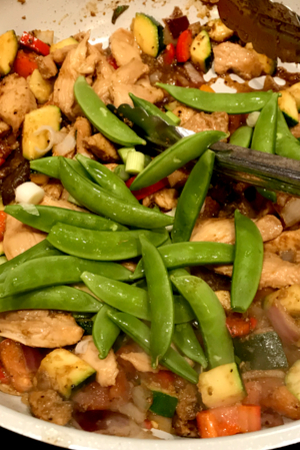 When someone asks me for a quick and healthy dinner idea one of the first things that comes to mind is chicken teriyaki stir fry. It is one of the most popular dishes, along with Beef and Broccoli, served at my favorite Chinese restaurant. 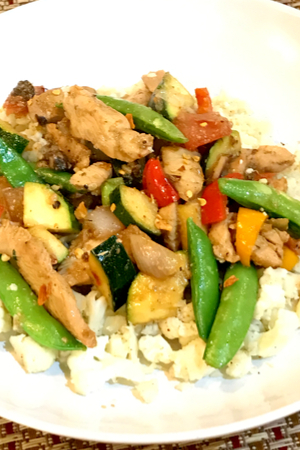 Chicken teriyaki stir fry served over cauliflower rice. Whenever I place my order, my meal is served in just a few minutes. It comes so fast that I joked with my server that it must be pre-made. She quickly took my hand and told me to come with her. She escorted me to the kitchen and simply told me to watch. Once she submitted my order, the chef grabbed the fresh ingredients from the containers and threw it in two hot woks. Slice your chicken in thin strips to make them cook even faster. Within 5 minutes I had a plate of chicken teriyaki stir fry on my plate, ready to eat. I was impressed! With everything pre-cut it literally took only minutes to cook. So now, this has become my go-to, busy weeknight meal that I prepare in my own kitchen. To make this recipe even easier, I try to do a little prep work ahead of time. Chicken and teriyaki sauce cooking in a hot wok. 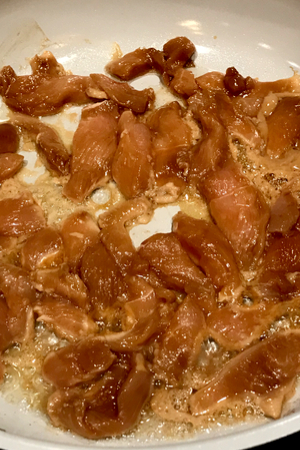 If I know that I have a busy week ahead, I will slice my chicken breast into strips and marinate them in a pre-made teriyaki sauce. Yes, you can definitely make your own sauce. But let’s be realistic. Sometimes a bottle of teriyaki sauce comes in handy. I will also chop up whatever vegetables that I have on hand. Red peppers, onions, broccoli, zucchini, carrots, you name it, they all get thrown in. I simply cut them up and place them in the same container until ready to be cooked. Vegetables cut up and being cooked in the same wok as the chicken. The only vegetable that I don’t put in with the others is is the sugar snap peas. I like them to remain crisp, so they are added at the end of the cooking process. But don’t worry, you can still make this recipe even if you didn’t have time to prep the ingredients beforehand. The first step would be to make your rice. Depending on the type of rice that you choose it can take anywhere from 5 to 20 minutes to prepare. Now that the vegetables are cooked, it is time to add in the sugar snap peas and chicken. It makes for a great for a low-carb meal and the riced cauliflower cooks in just a few minutes. Next you would slice your chicken and marinate it in your teriyaki sauce while you cut your vegetables. This allows some of the flavor to penetrate into the chicken before cooking. And don’t be afraid to use a variety of vegetables in your recipe. We make this once a week and I don’t think we have ever used the same combination of vegetables. In the restaurant the chef used two woks – one for the chicken and one for the vegetables. The final step – toss everything together before serving. Because I don’t have two woks, and because I don’t want to do any more dishes than I have to, I had to decide what to cook first. I have tried it both ways, and I prefer to cook the chicken first. And don’t worry if you don’t have a wok, you can use any large skillet. Simply place the cooked chicken strips in a large bowl until the vegetables are nice and tender. Then simply add the chicken back into the wok for a final toss with the vegetables before serving. And there you have it, a delicious, quick and healthy meal made in minutes. 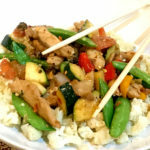 A classic chicken stir fry recipe filled with a ton of flavor and crisp vegetables and served over rice. Place sliced chicken breast strips in a large ziplock bag and pour marinade over top. Toss the chicken until well coated and set aside. Prepare vegetables by washing and cutting them as stated in the ingredients list. Heat a large wok or skillet over medium-high heat. 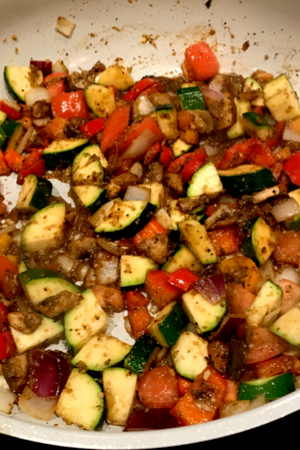 Once hot add 1 tablespoon of extra-virgin olive oil and marinated chicken strips. Cook until chicken is no longer pink, approximately 3-4 minutes. Place chicken in a large bowl, cover and set aside. 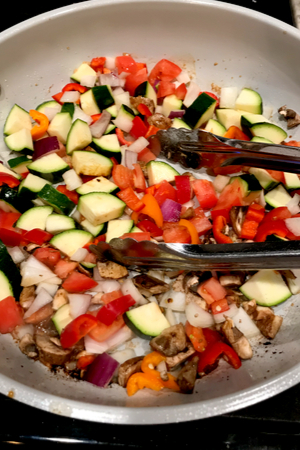 Add the remaining 1 tablespoon of extra-virgin olive oil to the hot pan and add the red pepper, onion, mushrooms, zucchini to the pan. Cook just until tender, approximately 4 minutes. Add in the sugar snap peas and cook for an additional minute. Pour the chicken and any liquid from the bowl back into the pan. Toss with the vegetables for 1-2 minutes. Serve over cooked rice, or cauliflower rice. Garnish with green onions.